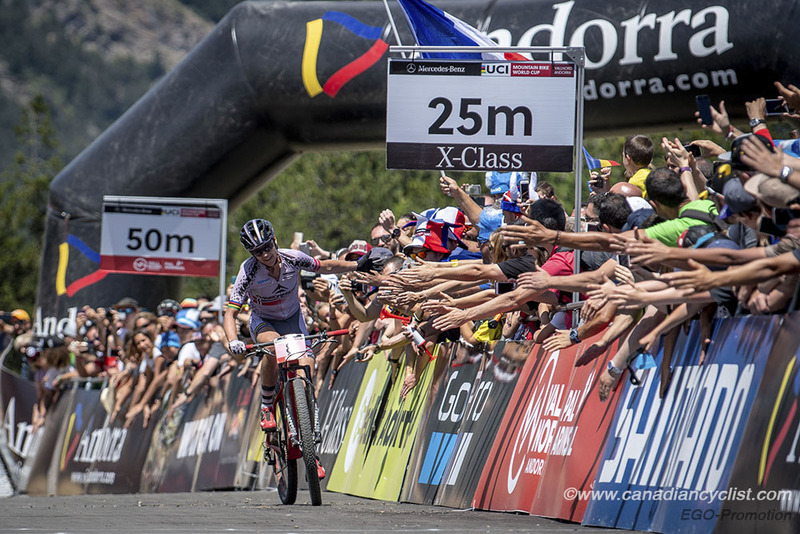 Round 5 of the XCO Mountain Bike World Cup in Vallnord, Andorra, proved to be a historic occasion, with Norway's Gunn-Rita Dahle Flesjaa (Merida Gunn-Rita) showing once again why she is the best female mountain biker in the history of cross-country by taking her 30th World Cup victory on Sunday. Dahle Flesjaa joins retired men's leader Julien Absalon of France as one of only two riders to break the 30 World Cup win mark in XCO. 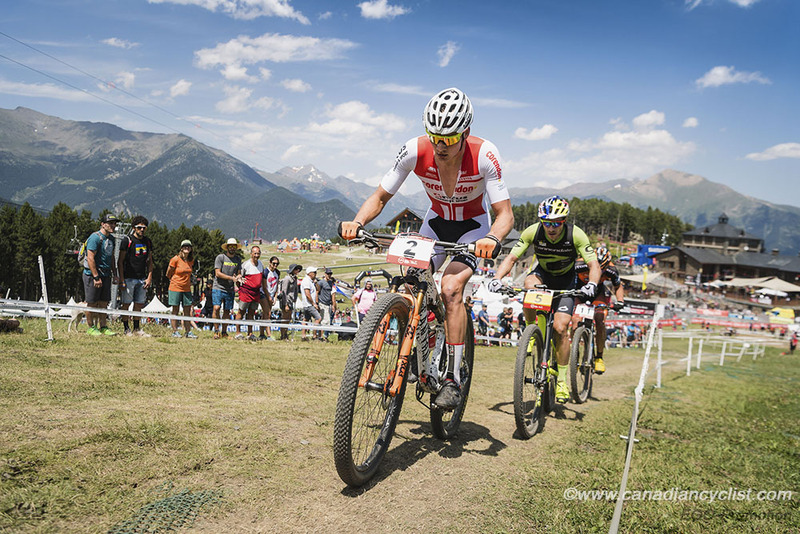 In the men's race, Gerhard Kerschbaumer (Torpado Garbogas) became only the second rider in two years to beat Nino Schurter (Scott-SRAM), as he took the first World Cup win of his career. 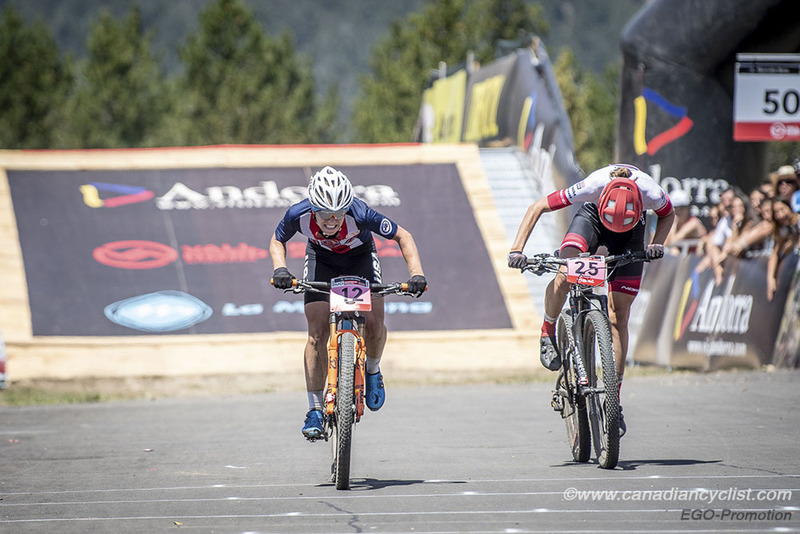 Dan Proulx, National Mountain Bike Coach at Cycling Canada, called the weekend a success. 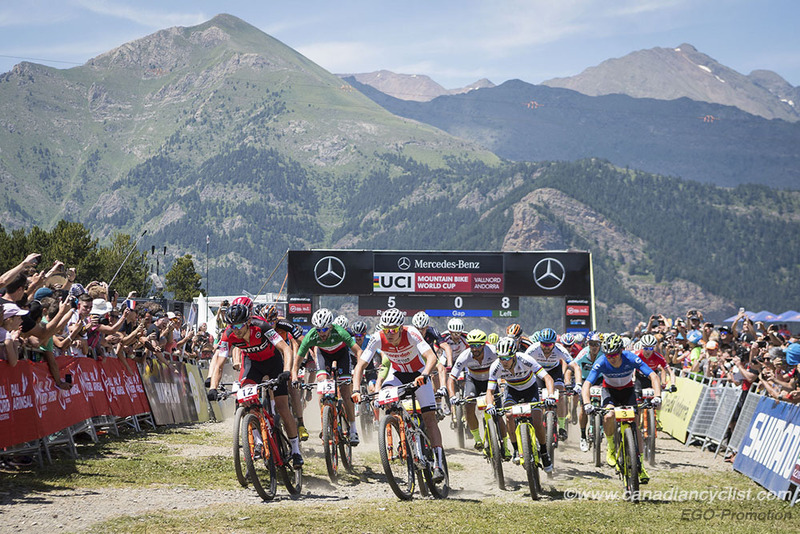 "We're really pleased with how Vallnord turned out. It's a tough race and it's at altitude. Sean and Mackenzie lead the way for the Under-23's - both finishing 19th. 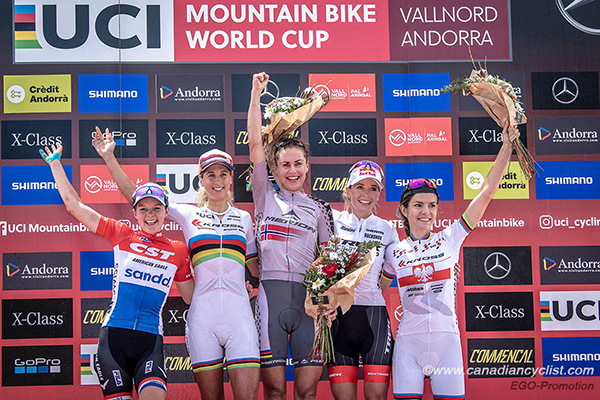 Our Elite women were exceptional, with Emily riding strong to get third, Haley with a best-ever World Cup result and Sandra with a second best-ever finish. All great rides in difficult environmental conditions. So, we're pleased and will plan to do even more preparation for this event in the future." 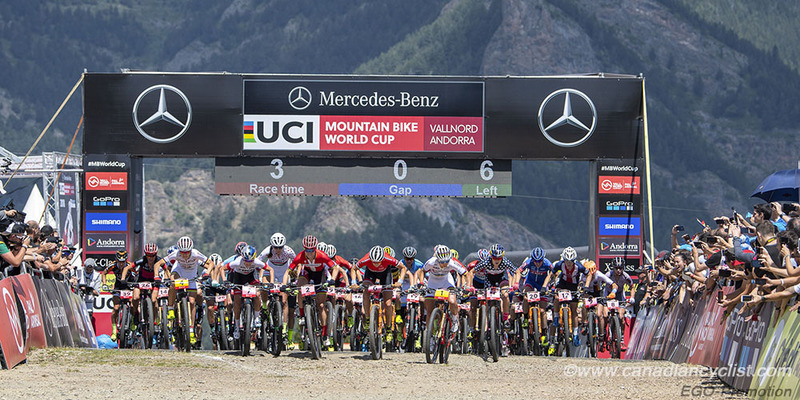 Andorra is a unique race, with the riders racing at 2000 metres of altitude and facing some of the steepest climbs of the season. More than one rider has gone out too fast in the early laps, only to pay for it later in the race. Canadian women's champion Emily Batty (Trek Factory) continues to show strong form, finishing third despite a mechanical problem. For the second straight weekend, both Haley Smith (Norco Factory) and Sandra Walter (Canadian National) were in the top-20, finishing 13th and 17th, respectively. Leandre Bouchard (KMC-Ekoi-SR Suntour) was 34th in Elite men, matching his best result of the season, while Under-23 riders Mackenzie Myatt (Canadian National) and Sean Fincham (Canadian National) both finished 19th in the women's and men's races respectively. Jolanda Neff (Kross Racing), the women's world champion and World Cup leader, got off to her patented fast start, but was quickly joined by six riders - Dahle Flesjaa, Emily Batty (Trek Factory), Anne Tauber (CST Sandd American Eagle), Maja Wloszczowska (Kross Racing), Annika Langvad (Specialized) and Kate Courtney (Specialized). By the second lap, Neff's pace had burned off everyone, but Dahle Flesjaa was staying within a handful of seconds. Batty had suffered a mechanical problem (dropped chain), and the others were struggling with the pace. Courtney and Langvad - who came into the race only 27 points down on Neff - gradually fell back for good, while Tauber and Wloszczowska chased together, followed by Batty, who had lost 15 seconds with her forced stop. Lap four of the six lap race proved to be critical, with Dahle Flesjaa joining Neff at the front, and Batty joining Tauber and Wloszczowska in the chase, at 38 seconds. The next lap Dahle Flesjaa attacked on the first climb and Neff couldn't respond. Batty also attacked in the chase to move into third, and looked to be catching Neff. The Swiss rider recovered slightly in the last lap to hold onto second, with Batty third. 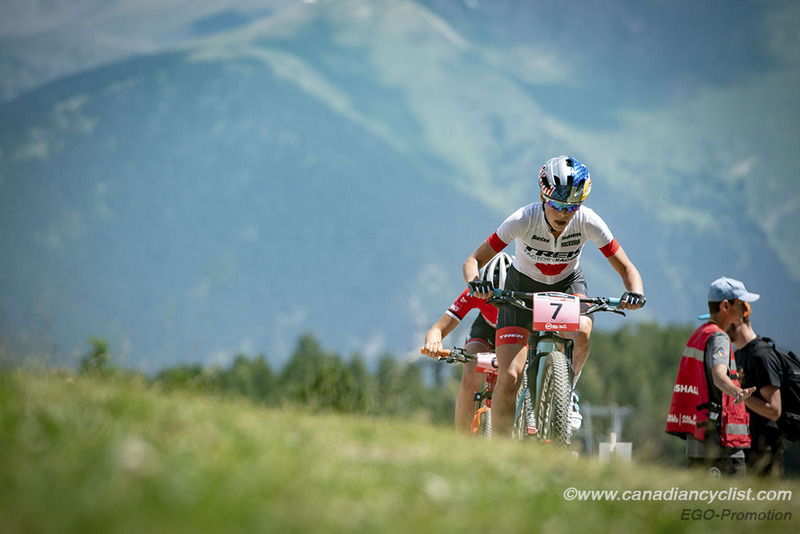 In addition to Smith's and Walter's top-20 finishes, Cindy Montambault (Canadian National) was 34th, Elyse Nieuwold (Pendrel Racing) 39th, Catherine Fleury 43rd, Rebecca Beaumont 44th and Maghalie Rochette (Clif Pro Team) did not finish. However, the story was all Dahle Flesjaa, winning at 45 years of age in her 22nd World Cup season. This is Dahle Flesjaa's 119th World Cup start, giving her a remarkable 25% win percentage. "This is almost beyond a dream," said Dahle Flesjaa.. "Of course, I have believed for many years that it is possible, but it is still awesome. I have to dedicate this 30th World Cup win to my sponsor Merida Norway, who are celebrating their 30th year. We have worked hard for this and I have a fantastic team; my husband is the greatest coach and training partner. In altitude you can't put the gas on too much; I think I used a lot of my experience - I have some years behind me! I had confidence from doing well here in races before. I saw that she [Neff] was starting to have stiff legs and maybe she pushed too hard on some climbs." "I had a great first lap and felt really strong," said Batty. "I made a mistake [shifting] into one of the corners going from a downhill into an uphill, so I lost time there. I had a strong race and felt good despite the altitude; I did some training at altitude in Livigno [Italy]. I was well prepared and going for it, but that one mistake cost me a lot of time. So the rest of the race was a matter of trying to make up that time, so third is pretty good for today." Haley Smith: "I had a good race today. It is a best-ever result, and I followed my process perfectly. To be honest, I was really scared before the race because I felt so terrible in short track, but I just stuck to my guns and it worked out! I was mentally prepared for the altitude to be tough, so I changed my typical race plan a little to accommodate." Sandra Walter: "This is my second-best Euro World Cup and third-best ever. Definitely my best at altitude. I was 28th here last year. I sure noticed the altitude. It affected my pacing and my sensations. At the beginning, it didn't feel like I was pushing very hard, but my lungs were struggling to take in enough oxygen. I thought maybe I was being too conservative, but later in the race I really started to suffer and so I think I paced pretty well." "Starting in the second row was really cool and it was awesome that I didn't have any traffic to deal with. But it was also challenging, because I was not necessarily in control of the pace, so I was a bit worried I'd get carried away and overextend myself early. When I start in my "normal" place, it's kind of easier, because the traffic forces me to start a bit less fast and then once things spread out, I can step on the gas and ride my own speed, picking riders off along the way. That's also mentally easier than starting at the front, when you're already where you want to be and everyone around you is fast and you're already in caught in epic battles from the gun and there's much more back and forth." "I'm not sure my better start position made a big difference in the end. Last weekend, when I started farther back, I finished 18th, and today I finished 17th. But I'm really happy with my progression this year. It's exciting to go from being a top-30 World Cup rider to a top-20 rider. Thanks to everyone for the support this season. The Cycling Canada program is dialed and everyone is doing everything they can to set the team up for success. So awesome to see strong rides again today from Emily and Haley, as well as the U23s." In the overall standings after five of seven events, Neff padded her lead on Langvad, and is now at 1250 points to Langvad's 1133. The next five spots are all within 72 points, with Wloszczowska in third at 927 and Batty in eighth at 855 - actually dropping one spot as Dahle Flesjaa moves ahead. 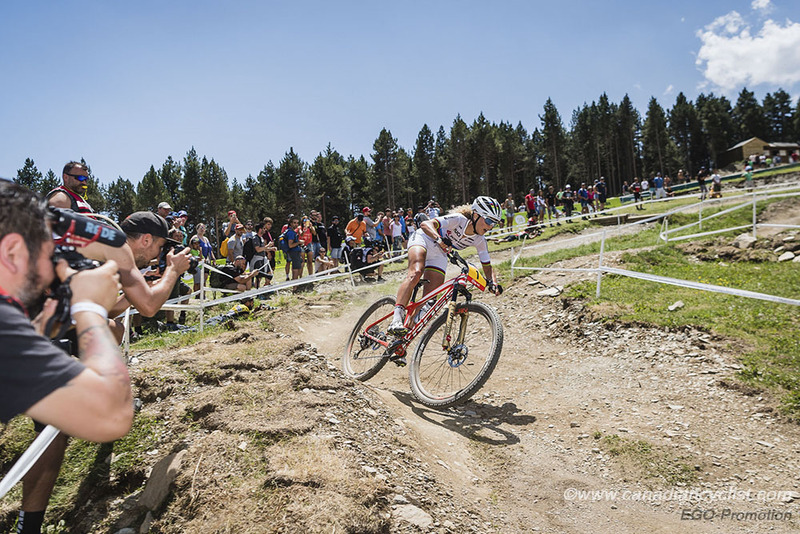 Other Canadian standings include Smith in 201th (up one spot), Walter 22nd (up two), the injured Catharine Pendrel (Clif Pro Team) drops to 25th, Montambault moves to 39th from 43rd, Beaumont up to 62nd from 68th, Fleury to 68th from 73rd, Rochette to 70th from 73rd, and Nieuwold to 72nd from 89th. 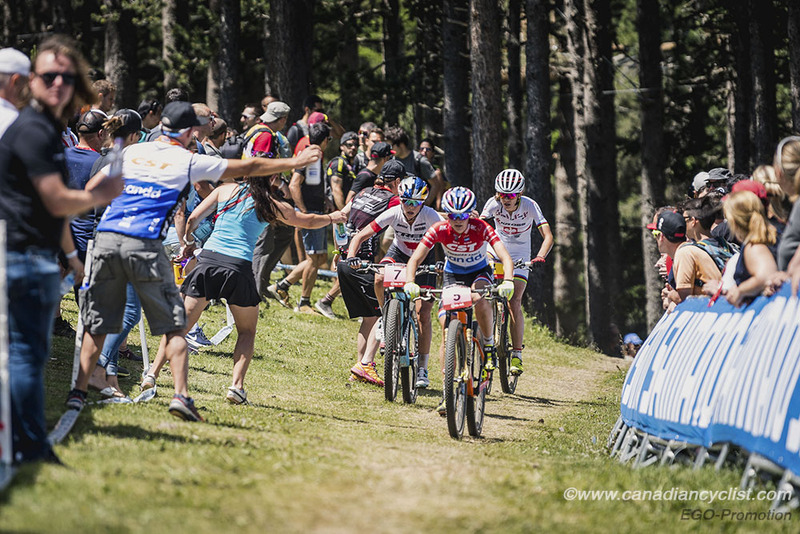 In the men's race, as usual, Schurter went out hard on the opening lap of the eight lap race. Kerschbaumer was the only one to bridge up to the Swiss rider, late in the first lap, while a chase group of three formed behind - Mathieu van der Poel (Corendon-Circus), Henrique Avancini (Cannondale Factory) and Jordan Sarrou (KMC-Ekoi-SR Suntour). This set the top-5 for the rest of the race, as the front two steadily pulled away from the chasers. 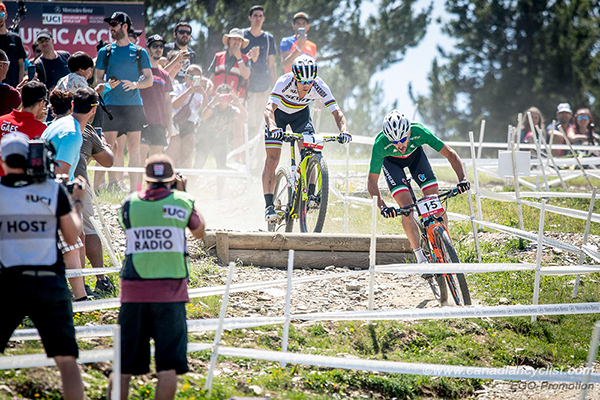 Kerschbaumer was clearly the stronger on the steep climbs, but Schurter would close the gap with his superior descend skills every time until the sixth lap, when the gap opened to 11 seconds on the first climb, and Kerschbaumer was able to extend it on the second, main climb. Schurter was clearly struggling with the altitude, and dropping back further at every time split, eventually finishing 1:13 behind the Italian champion. Van der Poel had attacked his chase companions on the fifth lap, and slowly eked out a small lead through the remainder of the race to finish third for the second consecutive weekend, followed by Avancini, fourth also for the second time in back-to-back weekends. 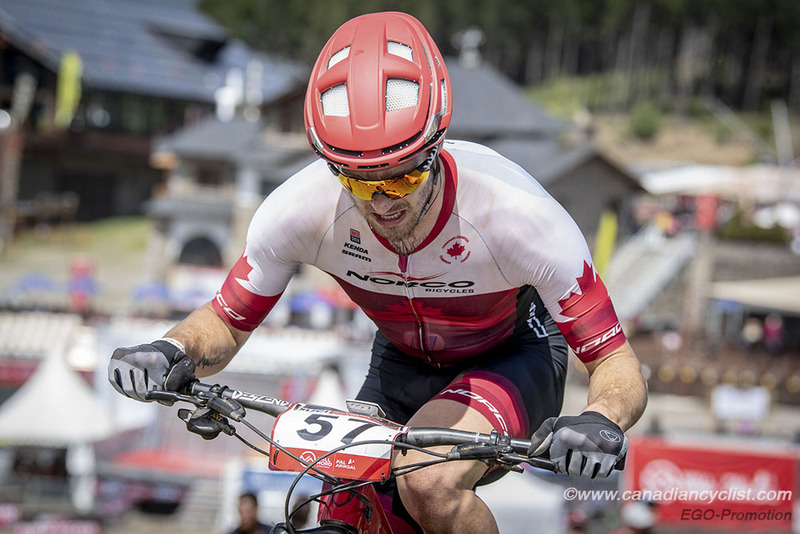 In addition to Bouchard's 34th, Peter Disera (Norco Factory) made the top-50 in 43rd place, Raphael Gagne (Silverback OMX) was 61st, Andrew L'Esperance (Canadian National) 69th, and Alexandre Vialle 90th. "This win means a lot," admitted Kerschbaumer. "One week ago I was second behind Nino and today ... it was amazing. The altitude I like a lot ... I spent two months at home at altitude and it worked. In the downhills, Nino was stronger than me, but in the long climbs I think I was a little bit better, and I attacked there." 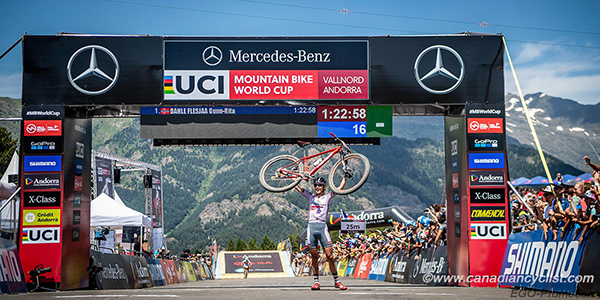 Schurter agreed that the altitude had an impact, "It was a super tough one; I really felt the altitude and I couldn't really go to my limit. Gerhard was super strong on the climbs and I felt halfway through the race that i had to [back off] a bit or I was going to explode." "It's encouraging and it feels good, because I have had some difficulty lately with my performances," said Bouchard. "It was very close in the group I was riding with, and there were ten places less than a minute in front of me. I really did good race management at altitude and where it was constantly hot. It was been a very difficult race, but it's also very encouraging for next week's Canadian Championships in Canmore. " "It is always tough to race at altitude, but today was nasty," said Peter Disera. "For the first few laps I couldn't control my breathing and, combined with a poor start, where I got pinched and didn't have the horsepower, meant that I was going backwards fast. Luckily the body came online and I managed to turn it all around. I fought very hard for the last half of the race to move up to 43rd. Not stoked but content." The second place finish has no effect on Schurter's overall lead, and he now has a commanding 1405 points; 325 more than van der Poel. 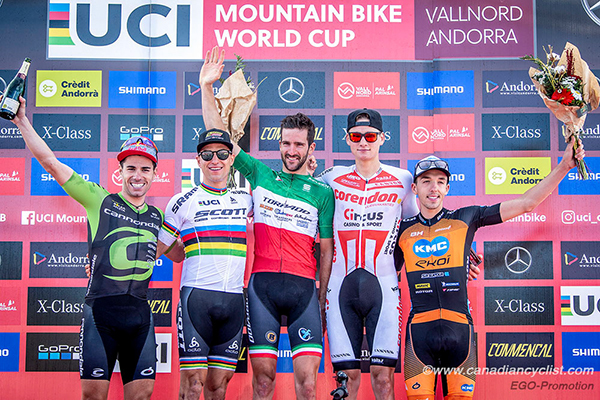 Schurter could wrap up the World Cup title at the next round in Mont-Ste-Anne, Canada, with another strong performance - where he could join the '30 Club' with a win. 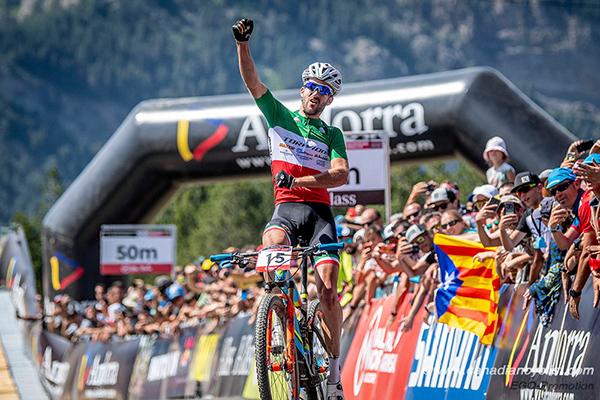 Avancini, who is having a breakthrough season after winning the XCC short track on Friday, jumps from fifth to third in the standings at 861 points, displacing Cannondale team mate Maxime Marrotte. Both Bouchard and Disera move into the top-50, with Bouchard up from 57th to 49th and Disera to 50th from 52nd. Gagne drops to 76th from 73rd, and L'Esperance to 91st from 87th. In the Under-23 races, Sina Frei (Ghost Factory) won her fourth straight women's race, all but locking up the women's World Cup title. In addition to Myatt's 19th, Juliette Tetreault (Canadian National) was 25th and Anne Julie Tremblay was 30th. The Under-23 men's race was won by France's Joshua Dubau, taking his second victory of the season. 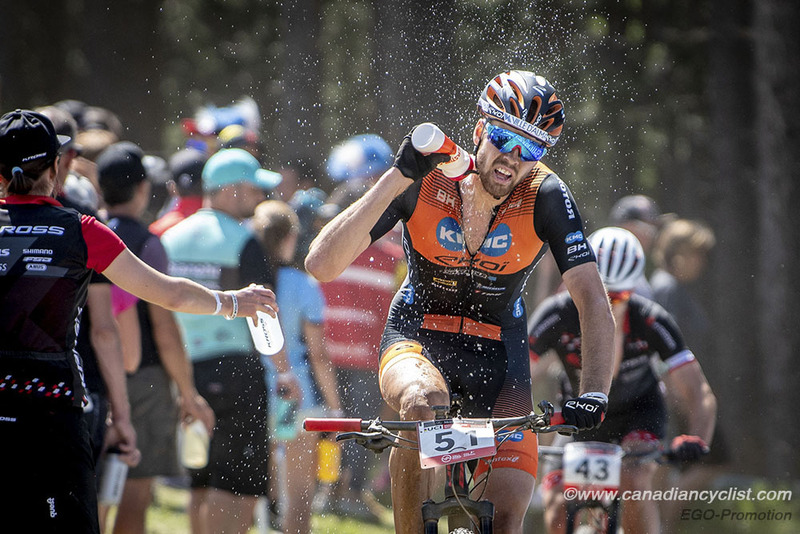 in addition to Fincham's 19th, Raphael Auclair (Pivot OTE) was 32nd, Quinton Disera (Norco Factory) 33rd, Brody Sanderson (Canadian National) 45th, Marc Andre Fortier (Pivot OTE) 45th, Gunnar Holmgren (Canadian National) 63rd and Felix Belhumeur (Pivot OTE) 67th. Norway's Petter Fagerhaug continues to lead the standings with 300 points, ten points ahead of Dubau. Fincham remains 28th in the standings.